Warm hot cross buns; spiced, zested and dripping in butter, are as synonymous with spring as blossom and Easter egg hunts. I find the flavour particularly nostalgic, so thought I’d apply it to one of my favourite things- ice cream. This is made up of a classic custard base (which I infused with cardamom, mixed spice and cinnamon), a buttered hot cross bun crumb and plump orange-soaked raisins. The result is so delicious we got through about 1.5l in three days (wouldn’t recommend this). 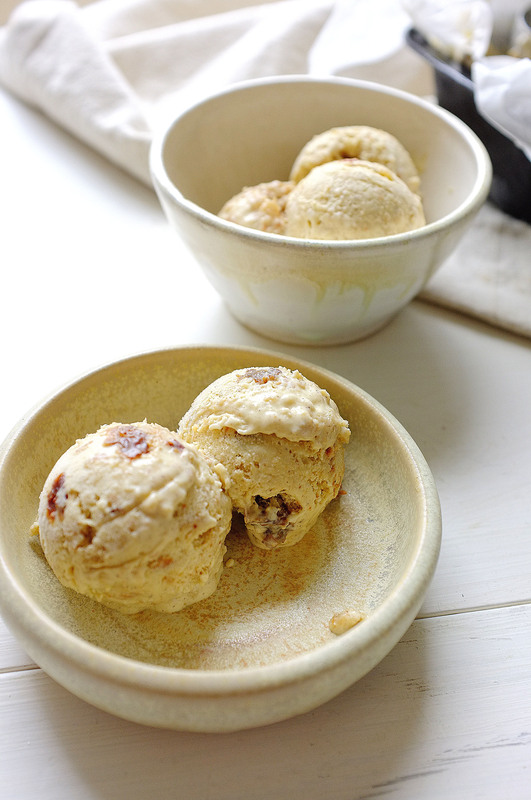 You will need an ice cream churner for this recipe. If the bowl of your churner needs freezing, do this the day before. Pour the milk and cream into a large saucepan. Add the cinnamon stick, nutmeg, cardamom pods and mixed spice. Gently heat the milk to scalding point (just as it starts to simmer) then remove from the heat and leave to infuse for 10-20 minutes. Meanwhile, whisk together the egg yolks, caster sugar, soft light brown sugar and salt. Once this mixture is voluminous and light, strain the milk through a sieve and add in in a steady stream, whisking constantly. Pour the custard into a large clean saucepan and heat very gently, stirring constantly, until it thickens enough to coat the back of a spoon. Remove from the heat, close cover and leave to cool completely. Preheat the oven to 190c. 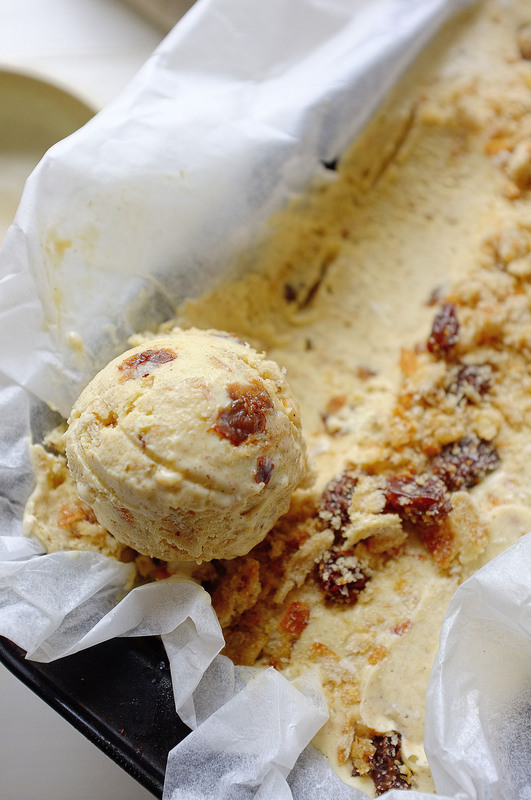 While the ice cream base is cooling, make the hot cross bun crumb. To do this simply blitz the hot cross buns into a coarse crumb, then tip into a large frying pan along with the butter and demerara sugar. Stir to coat the crumbs in the melted butter and once they begin to crisp, tip onto a lined baking tray. Bake for 10-15 minutes or until golden. Set aside to cool. Place the raisins in a small bowl along with the orange juice and zest. Leave them too plump up. Once your ice cream base is completely cool, churn it for about 10 minutes or until it’s starting to thicken. At this stage, add 3/4 of the hot cross bun crumb and most of the plumped raisins. 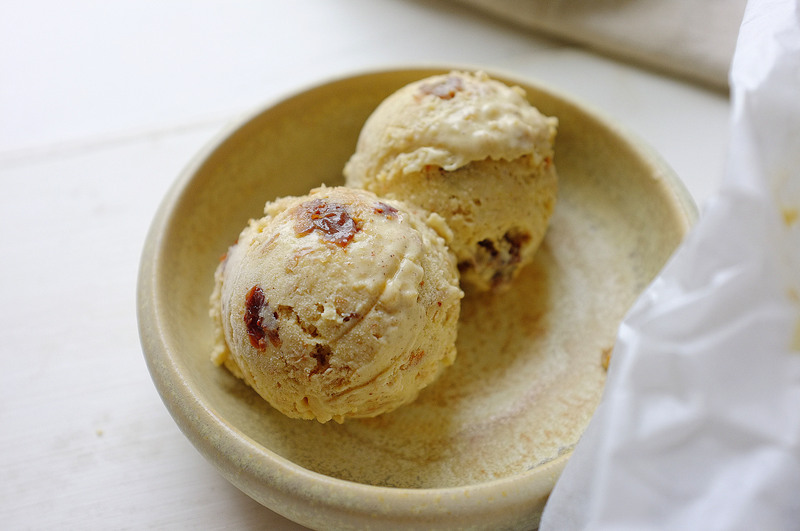 Continue to churn until thick, then tip into a large lined container, top with the remaining crumb and raisins and freeze for at least 4 hours. At this point, it’s ready to serve.